Warp One uses a single card from a normal deck... held out at the very tips of your fingers. You fold the card in half then simply wave your fingers over the card, and the single card visibly turns inside out: First half the card, then the other half (both sides are shown), then the card turns completely inside out and then back to half and half. Each stunning visual change happens with a single normal card held at the tips of your fingers! You end with the classic Roy Walton ending by tearing the warped card in half and handing out the pieces for examination. 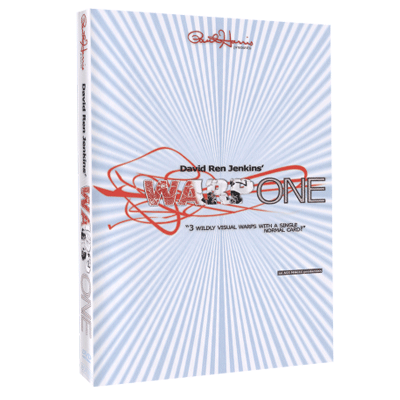 David Ren Jenkins' Warp One is a visual treat. The moves are completely invisible. The handling is a downright joy to perform. All you need is a single card and your bare fingers to permanently warp your audience's reality. Includes David's special handling for restoring the card. THE FINGERS MAKE NO MOVEMENTS OTHER THAN A GENTLE WAVING ACTION!